In this entry, we will see how to configure the development environment for both ColdFusion and Lucee, specifically on Mac, but the process is relatively the same, the difference lies in the version that is downloaded. 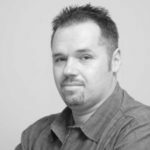 The ColdFusion Express Express distribution is the fastest way to install and run a ColdFusion server for development and debugging purposes without having to go through the entire installation process. This excludes some functionality features but is not required to develop and debug such as SOLR, Integration with .NET, remote administration and PDF generation. If you need any of these components, it can be installed separately, or install the full trial version. You will be presented with a form and the final combo will present the test distributions for different platforms and languages. Pressing the Download button will start the download in a popup window. The link to download the express version you will find on the main screen. Unzip the downloaded ZIP file no matter which folder, we refer to this folder as <DIR-INST>. 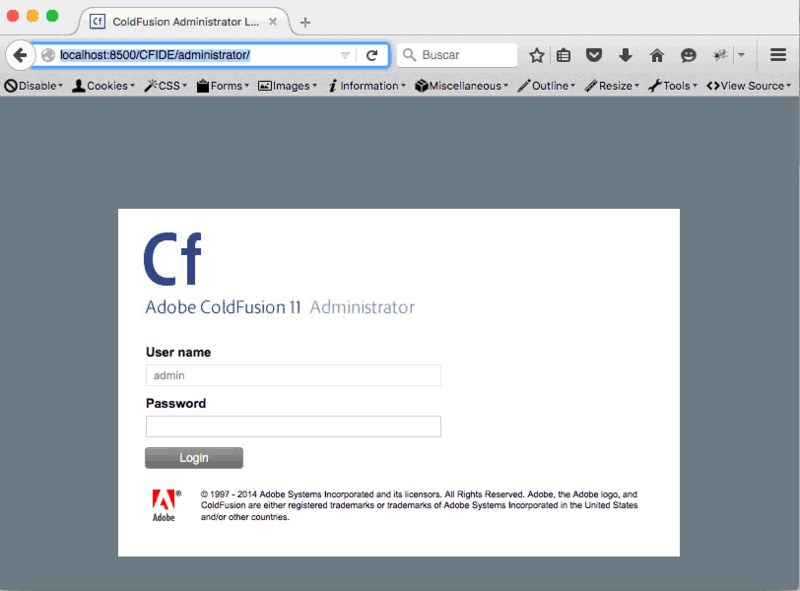 If you get the screen shown in the previous point, ColdFusion is up and running. Type “admin” in the Password field and you are ready. You can start with the configuration of the server which we will leave pending for another publication. 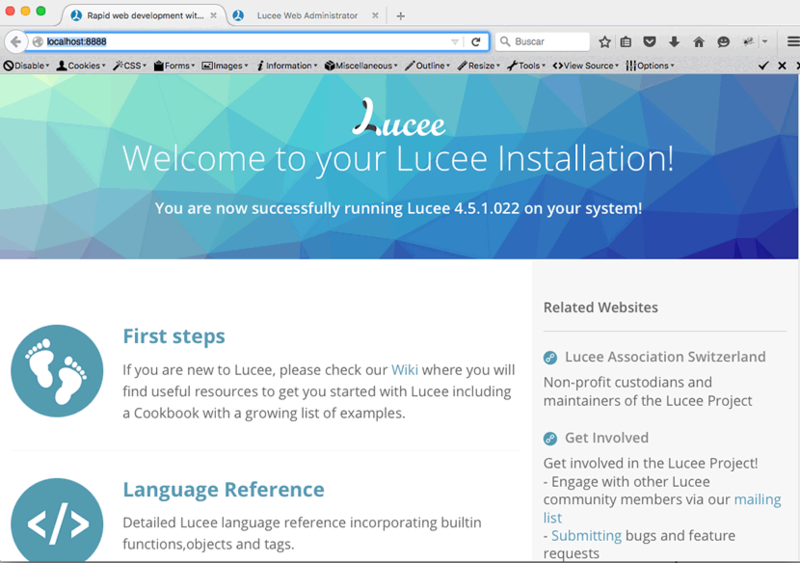 The Lucee team also has its express distribution in version 4.5 and version 5 beta to be released soon. 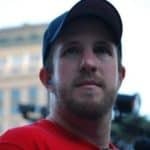 Download the express distribution at http://lucee.org/downloads.html and unzip. No matter which folder, we refer to this folder as <DIR-INST>. The first time you enter the administrator, you will be prompted for a password of 6 characters or more, with which you will enter later, the server configuration will be covered in another publication. You might want to know this also: Is Lucee CFML now better than Adobe ColdFusion? 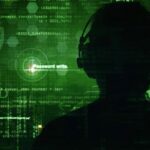 Download CommandBox http://www.ortussolutions.com/products/commandbox#download , if you do not have Java installed on your computer you can download the version with JRE Included. It decompresses and executes the file executable Box, depending on the platform in which you are on Mac, for example, you can open a Terminal window and type “box” or simply double click on the file; In any case you will get a start message in Terminal like the one shown in the image. 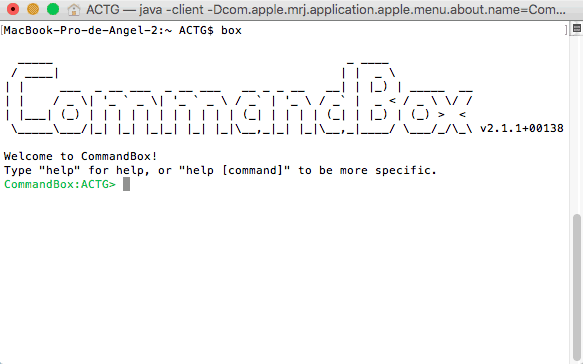 The prompt will be displayed as CommandBox: <user> indicating that the application is running. *Note. This is not a Terminal (Mac) or MS DOS (Windows) console. CommandBox has some instructions for managing directories like mkdir, cd and ls. If you want to get help about the available commands type “help” and press Enter. 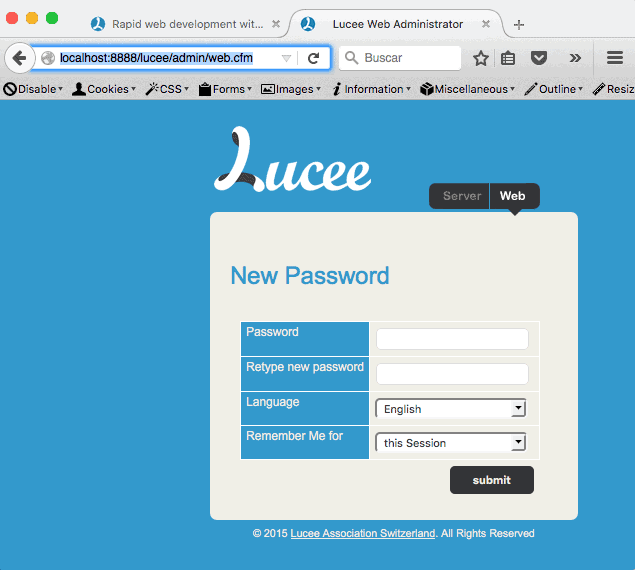 To start the Lucee server embedded in the application, navigate to the directory where your application is located eg cd angel / sites / mysite and once you are in the directory type start and press Enter. CommandBox will open a web browser window with the application running in Lucee. You assign a different port for each running application. You can run several applications at the same time and change the port for each one of them and an icon with the Ortus Solutions logo will appear on the taskbar. Clicking that will display a menu to terminate the application or open the server administrator and be able to add DataSources or other types of configurations. Integrated Development Environment ( IDE ), is a computer application that provides comprehensive services to make it easier for the developer or programmer to develop software. There are several applications that integrate help in CFML commands as well as intelligent code autocomplete (IntelliSense). Listed below are some open source and other commercial applications. Eclipse is an open source IDE widely used for its wide variety of plugins and support by the community, the application alone does not support ColdFusion, this is added by installing a plugin called CFECLIPSE, which adds function dictionaries and tags for ColdFusion up to version 9 and Railo up to version 3, offers syntax highlighting for better visualization of the code, Eclipse releases a new version every year in 2015. The distribution in turn is called Mars. We will download the package for PHP as it includes several functionalities. For web development and version control, and later install the CFECLIPSE plugin. Download ECLIPSE Here and unzip it in any folder. Enable the CFeclipse box. The second is optional this enables a CFEclipse plugin for DocShare which is another plugin that allows real-time sharing of the editor with another developer who is connected. Click Next. 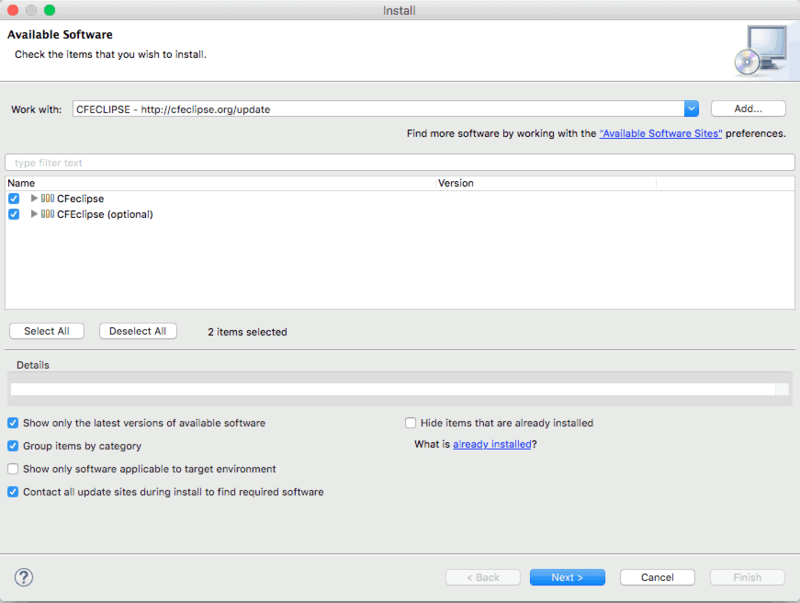 Eclipse will take a few seconds looking for the packages you have to download, click Next again. Accept the terms and license conditions and click on Finish. Eclipse will show the progress of the installation in the bottom right of the editor window. This can take several minutes. If you get a security alert window, press OK. When you are asked if you trust cfeclipse certificates, check the box and press OK. Eclipse will restart. Select CFeclipse; The CFeclipse icon will be added to the Perspective icon group and will change the default perspective of CFeclipse. Now you are ready to add your first ColdFusion project. It is an Eclipse plugin that adds FTP functionality, and support for other technologies, languages and frameworks for web development. It is a commercial IDE provided by Adobe, it allows to develop web and mobile applications, debug, IntelliSense, inspect the view on different devices and manage ColdFusion servers, it is a fairly complete tool at a cost of $ 299 USD, you can install the trial version Which has all the functionality for a while, then limits certain features. Run the installation file follow the instructions. 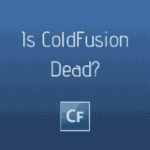 ColdFusion Builder can be installed as an Eclipse plugin or as a stand-alone application.